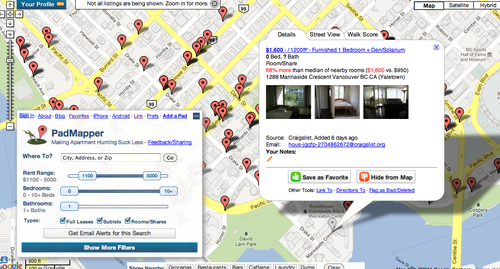 Forget craigslist.. padmapper.com is the way to go if you are looking for new place to call home in the rental world! I remember my experience with Craigslist a few years back when I was looking for my first rental apartment Downtown. It was like sifting through my spam folder trying to find real emails. I'd click and read each listing, only to find out that it was in a bad location, or it looked like a slum. 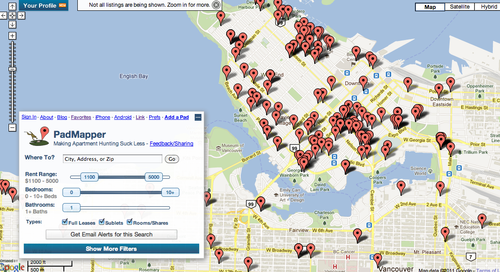 PadMapper makes apartment hunting less awful, almost fun. It does this by plotting the apartments are on a big (google) map, and let's you filter your results till you find exactly what you want. If you’re particularly interested in a place, you can zoom in very close, see all the listings details and check out nearby restaurants, shoping etc. You can even save the specific listing to your favorites if you create a profile! There are also neat overlays to help you learn about the different areas. With a baby on the way within the family (future sister in-law is due next month) I've found myself checking out nursery pictures and thought this was a simple makeover that took this nursery to the next level! Loving the mixture of patterns going on here! A beautiful environment for a baby to explore, but also one that is sophisticated and modern enough for parents to enjoy! More from Design Sponge here! 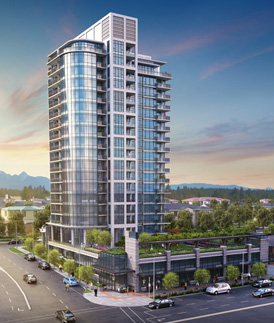 I have just recently sold this listing at #411 - 1990 E KENT AV, Vancouver.